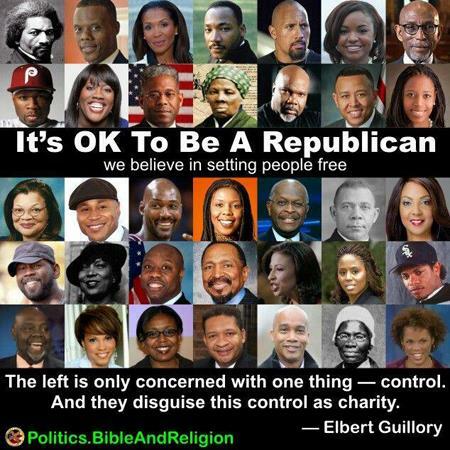 Unless you have party leaders who are totally committed to the issue of diversity and willing to radically alter the “institutions” of the Republican Party; there will never be an appreciable level of Black participation in the party. But this surface diversity means absolutely nothing unless and until you diversity the very structures at every level of the Republican Party. The irony of all ironies is that Donald Trump is the only presidential candidate to have any Blacks on his staff in any significant positions; Blacks that he doesn’t want to be invisible. Trump can easily get north of 15% of the Black vote simply by cultivating relations with the Black business community. Sadly, this is the one group most ignored by the Republican Party; the one group that is most philosophically in sync with the Republican message is the one group that no one pays attention to. Maybe Trump is unreasonable enough to literally change the face of the party and by so doing end up being elected to be the next president of these United States. Just something that’s worth thinking about. Hey Buddy!, I found this information for you: "An Unreasonable Approach to the Black Vote". Here is the website link: https://blackmeninamerica.com/an-unreasonable-approach-to-the-black-vote/. Thank you.